Nothing beats doing something for the first time, because you can never quite experience something that way again. Click here for the 1st blog post on Tristan's first Mt. 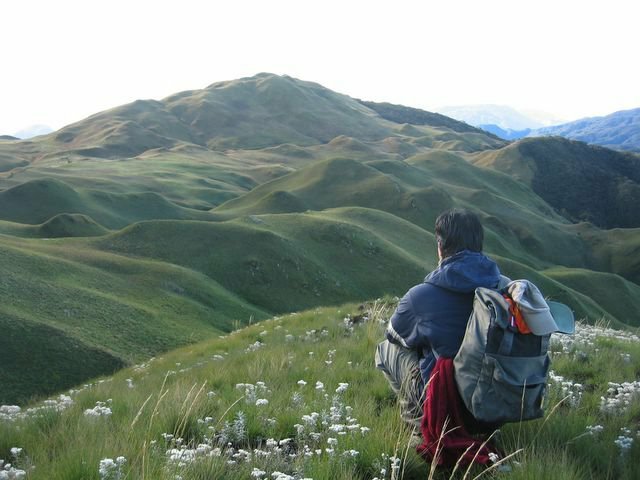 Pulag Climb that gave birth to this blog. On that trip, Tristan was with his best friends Russell and Edward. On this trip, Tristan was with his friends from the Royal Sinigang Mountaineers - an informal outdoor group he created with friends from his former company. The group started with their first outdoor activity together, climbing the Taal Volcano during Tristan's 28th birthday. Since then, they hatched the plan to climb Mt. Pulag, training themselves along the way with runs (they did their first run at the 2nd Pasig River International Marathon), hikes to Gulugod Baboy in Batangas, and a trek at Bagsit River in Zambales. This time, Tristan went with his friends JP, Chino and Gjay. It was Chino's goal to climb Mt. Pulag, and they were there to support him. It was a memorable adventure as they almost froze themselves to death :) on top of Mt. Pulag having ascended to the summit at so early in the morning at 2:30AM. It was raining, visibility was poor, temperature freezing, and they were just too early. BUT they survived and had so much memories to tell. Tristan wrote about that trip here. It was a Christmas climb with people who would later be among the pioneering members of ClubTravelNOW.org. It was also Paolo's first Mt. Pulag climb; he is to be Tristan's co-founder of ClubTravelNOW.org. Because it was just 2 days after Christmas, weather was freezing. One of the highlights of the trip was the exchange gifts they did at the camp, complete with Santa hats. It was to be the first official Mt. Pulag climb as ClubTravelNOW.org, since it was launched by Tristan and Paolo last September 11, 2010 in Coron, Palawan. The group was blessed with all the right things: a beautiful weather all-throughout, among the best sunrises at the summit, and a great company of friends. Less than 4 months from their last climb, Tristan and Paolo went yet again to Mt. 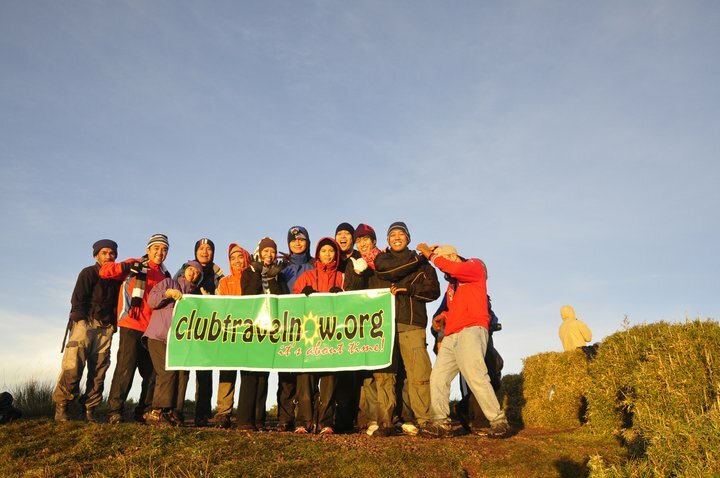 Pulag with ClubTravelNOW.org due to insistent public demand. Because of this blog, ClubTravelNOW.org had been receiving many requests to climb Mt. Pulag, and since it is ClubTravelNOW.org's advocacy to promote travel in the Philippines, we had to oblige. This was our coldest climb yet - experiencing 2 degrees at the summit. And visibility was poor at probably just 4 meters. Unlike our February climb, we had great weather this time around and one of the best sunrises. We also had the biggest group so far - what with 2 big families coming with us. This is also the trip where we had both the youngest and the oldest participants we've ever been with - a 9-year old and a 69-year old - both of whom had no trouble at all during the climb. This also proved to another great climb, as evidenced from the beautiful sunrise photos captured by our participants. Somebody from the April climb was celebrating her birthday close to the climb and treated the group to dinner at 50s Diner in Baguio (Thanks, Aipreel!). In this June climb, no one was celebrating, but we got our treat nevertheless from a generous participant (Thanks, Sir Frank!). This is the climb where we didn't even make it to the summit. Actually, we didn't even make it to DENR! We were advised that weather was good in Mt. Pulag even as there was a storm, so we went anyway knowing that mountain weather has a mind of its own. We made it to Baguio then to the Pinkanjo where we had breakfast, but a few meters from it, we encountered landlides; we turned back to go to Baguio, but there was already another landslide. So we were stuck at Pinkanjo for a few hours. The highlight of the trip became: (1) a fun game of Hi Jack! to kill time, (2) a tasty morsel of python cooked adobo-style after it was caught and killed in a tree beside Pinkanjo. When they cut open the python, it had a whole chicken in its tummy! This is our service to the country.